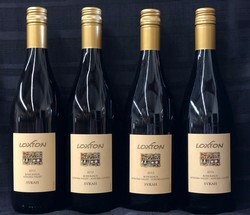 Located in the Heart of Sonoma Valley, Loxton Cellars is a working winery surrounded by 5 acres of estate vineyard. It is the intent of owner/winemaker, Chris Loxton, to produce handcrafted wines, made without compromise, that show balance and a sense of place. The Estate vineyard provides about 40% of the annual production which is typically 3,000 cases and the remaining fruit is sourced from premium vineyards throughout Sonoma County under long term agreements. Wines are sold through wine club, mailing list, tasting room and at a few local restaurants. The winery and vineyard are set up so that visitors may see all operations from grape to glass. Visitors are encouraged to join us for the Vineyard Walkabout tours on the weekends or for Reserve Tastings at 1:00 pm where we highlight an educational experience that connects the vineyard, farming and production methods and the resultant wine.